GFA wrestler Griffin Seyfried, right, competes against Staples during Friday’s Town Crown wrestling showdown in Westport. WESTPORT — The Greens Farms Academy wrestling team’s one and only home dual meet was quite memorable. The Dragons hosted rival Staples for the mythical Westport Town Crown and, after jumping out to a 36-18 lead, held off a furious Wreckers rally to prevail 42-39 in an exciting match in front of a packed crowd last Friday at GFA’s Bedford Gym. 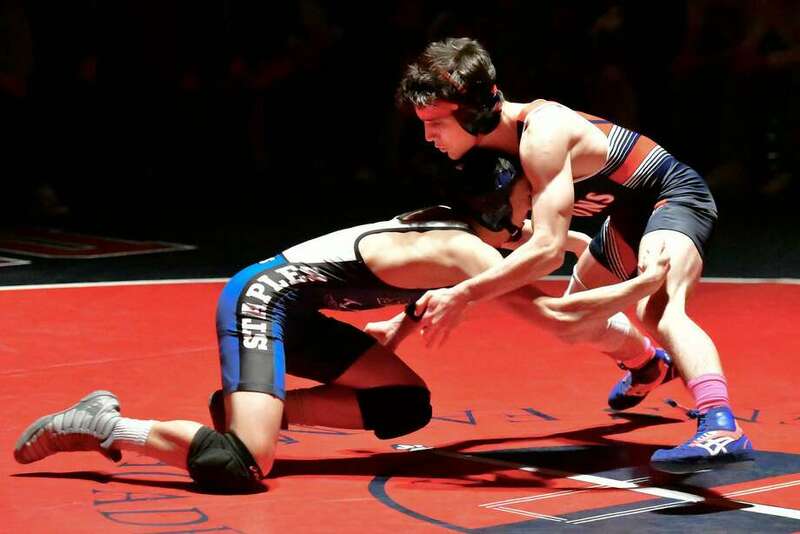 It was the second consecutive win over Staples for GFA in the three years the schools have been wrestling for the Town Crown. “We come ready for every competition,” Greens Farms coach Jack Conroy said. “It’s definitely not an anomaly. My guys love wrestling and they love to compete so we’re just really excited about the future of GFA wrestling. Conroy said the key to his team’s victory was the performances of his lightweights, whereas the Wreckers took the majority of the heavier weight classes. Even though the Dragons gave up two forfeits to start the match at 220 and 285 pounds to George Harrington and Jacob Rizy, respectively, they won the next four bouts to take a 24-12 lead. Winners by pin for GFA were Caleb Seyfried (106), Nico Provo (113), CJ Shea (120) and Griff Seyfried (126). Staples’ Noah Fraas ended GFA’s run with a pin at 132. Peter Kane (138) and Mike Bartush (145) each recorded pins to put the Dragons ahead 36-18. The Wreckers captured the next three bouts with Nick DiMasi (152), J.C. Montoni (160) and Jacob Qiu (170) registering first-period pins to tie the match at 36-36. The pivotal and most exciting match of the night occurred at 182 pounds when Johnny Jackson of GFA took on Owen Clarke of Staples. Jackson took a 3-2 lead into the third period before Clarke got an escape with seven seconds remaining to force overtime. Jackson secured a takedown in the first overtime period, which clinched the bout, but he was able to register a pin in 6:30 to give the Dragons the lead for good at 42-36. Conroy said he was the hero of the match for the team. Mills was very pleased with the performance of his last wrestler to compete, Nick Augeri, who earned a 7-3 decision at 195. Mills felt Augeri, who is only a freshman, had his opponent pinned inbounds toward the end of the match, but it was ruled out of bounds. The Wreckers have excelled this season for Mills with 11 wins going into Friday’s encounter and several top finishes in tournaments. They also closed the gap against GFA after losing by a wide margin to the Dragons last season. Staples hosted Trumbull on Thursday, Jan. 31. Greens Farms, meanwhile, recently placed second behind Brunswick at the FAA Dual Championships last Saturday, Jan. 26, at Hopkins. The Dragons went 3-1 on the day with Caleb Seyfried (106), Provo (113), Shea (120) and Kane (132) each going 4-0 to earn all-league honors. GFA will be wrestling at The Milburn School this Saturday.